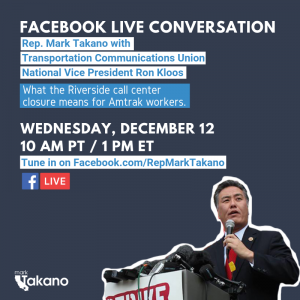 Join Congressman Mark Takano (CA-41) and TCU National Vice President Ron Kloos tomorrow for a Facebook Live discussion about Amtrak’s decision to close its Riverside, CA call center, put 500 TCU members out of a job, and send their work to a low-wage, no-benefit outsourcer. When: 1pm EST (10am PST) on Wednesday, December 12th, 2018. The post Join Rep. Mark Takano & TCU NVP Ron Kloos on Facebook Live! appeared first on IAMAW .